Clear Braces – A New Way to Achieve Straight Teeth in Reno! You’ve probably heard of clear braces and the benefits they offer. It’s true! You or your loved one really can get straight teeth with the less embarrassing clear braces treatment. 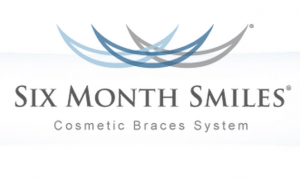 Six Month Smiles is a specific orthodontic protocol using clear braces (clear brackets and clear wires) to rapidly tame a crooked smile and turn it into a healthier and more attractive smile with straight teeth. You will first need to meet with Reno dentist Dr. Shane Sykes to determine if you are a good candidate for Six Month Smiles clear braces. It is likely you will be able to use Six Month Smiles to achieve straight teeth, but if for any reason you are not, Dr. Sykes can help you identify other options for you to get the straight teeth you desire. If you are able to use the Six Month Smiles treatment, Dr. Sykes will place the clear brackets on your teeth along with the clear wire that fits inside the clear brackets, forming the clear braces. The clear wire will then gently but consistently seek to shift to its final state, which is a perfectly straight arch. When the clear wire reaches its final state, you will be left with straight teeth. Clear braces by Six Month Smiles are pretty awesome! Yes, you really can have straight teeth in just six months; times may slightly vary, but six months is the average for patients to get straight teeth. The treatment is very comfortable since the wire gradually and gently moves the teeth until they are straight. With Six Month Smiles, there is no cranking down wires every month for tightening. You can smile with confidence WHILE your teeth are straightened because most people won’t even notice your clear braces. This is one of the major advantages of the Six Month Smiles technology. Six Month Smiles enables patients to save money because there are fewer office visits. The procedure is also less expensive procedure while still offering the same final result of straight teeth! Reno and Sparks, NV, residents should call today and set up an appointment to find out if Six Month Smiles clear braces are a good option for their straight teeth!